Ever heard of a ‘Small Thin Indian Wedding’? Sounds as alien to us as not dancing to “mere khwaabo mein jo aaye” at a Bollywood themed Sangeet ceremony. Well, it isn’t as alien as it seems to be, as this stunning couple, Taijasa and Prateek broke the ‘Big Fat Indian Wedding’ norm with their tasteful, intimate wedding at Oxford Golf Country Club, Pune. With only a handful of people that matter and truck-loads of filmy drama (the good kind), their wedding was one that ticked off all the boxes on elegance, style and class – And isn’t that the ideal way to do it. To not stress about whether or not your mamaji’s bahu has received the welcome gift basket, or whether your Delhi-wali-aunty-ji is comfortable in her room or why the caterers haven’t put out the gajar ka halwa yet?! Isn’t it a million times better to enjoy the things that actually matter – your family, friends and most of all, that one special person you picked to spend the rest of your life with. Taijasa and Prateek did exactly that and did it SO right. This wedding not only taught us that specialness lies in the simplest of elements, but also how and where to wisely spend hard- earned money. We love the fact that this couple splurged on a magnificent venue, a fantastic photographer and wedding outfits that left us spellbound! While keeping their guest list small, flower décor minimal and ceremonies simple. Remember reading Cinderella and Snow White as a little girl and wishing that you could just once live out that dream in reality? To wear a poofy gown and hold hands with your Prince Charming?! 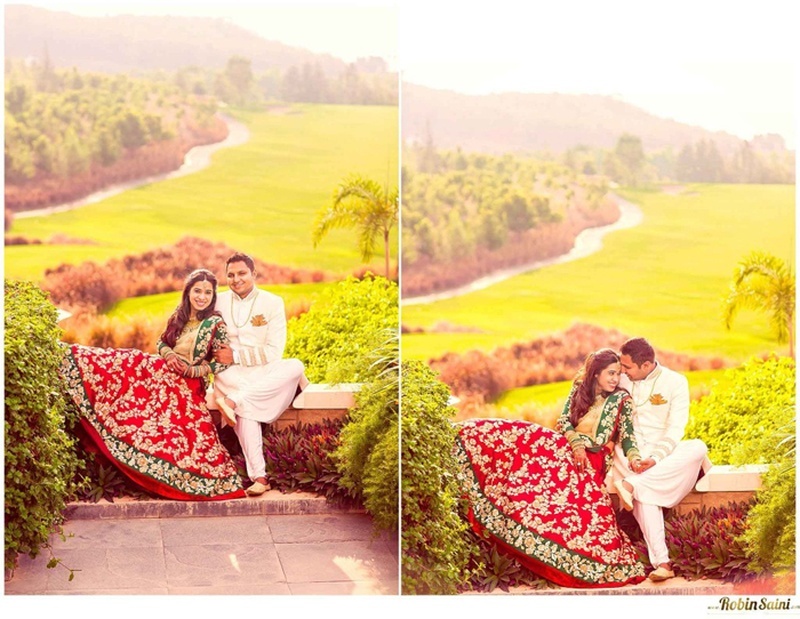 Well, Taijasa and Prateek’s pre-wedding shoot will sure assure you that fairytales truly come to life. Dressed in a gorgeous pink ball gown that gave us aaaall the Disney Princess feels, Taijasa kissed her beau, Prateek just as the sun set behind rocky mountains and lush green trees. Sounds like an unreal set up, but the brilliance that Robin Saini Photography is, helped this couple create their own whimsical tale in the heart of Pune city. Their haldi and mehendi ceremony was held at Taijasa’s home in Pune and had hues of bright orange and yellow in every element – Really, what is a Haldi-Mehendi without marigolds?! Everything from the jhoola in the balcony to the gate at the entrance was decorated with an abundance of these fresh flowers that added the right touch of ‘desi’ to their homely Haldi-Mehendi ceremony. The beautiful bride-to-be wore a coral and white anarkali lehenga designed by the exceptional Anita Dongre, and accessorized her look with multi-strand pearl jewellery. Her up-done French braid made her white pearl necklace and earrings the highlight of her entire outfit. For eons now, we’ve been talking about the brides lehenga/saree/anarkali and are so taken up by it that we sometimes, just sometimes skip the groom. But Prateek sure did make a statement with his floral printed aqua blue Nehru jacket – which had our eyes glued to him. Super special spaces in our hearts for men who can pull off floral prints so flawlessly! Yellow and white drapes that ran across the green lawn that held Taijasa and Prateek’s wedding mandap exclusively decorated only with white jasmine flowers strings strung onto a yellow hued frame. Continuing to exude the elegance of a princess bride, Taijasa walked towards her groom on a bed of flower for an aisle, wearing a classic Shymal and Bhumika bridal lehenga-choli. And the super stylish groom followed suit in his Shantanu and Nikhil bandhgala sherwani. Once the Pandit declared them Pati-Patni, the couple along with their friends engaged in an intimate lunch and then were soon off to capture some more moments of love and craziness with ace photographer Robin Saini. To end with, we HAVE to share with you the most aww-worthy picture from this wedding album. The subtle love peeking through this black&white image is oh-so-adorable, it will make you blush! Check out this stunning image which shows Prateek watching Taijasa as she gets ready for the wedding.